Your Hallet, Davis piano is a beautiful piece of furniture, as well as one of the world’s finest pianos. It is to your advantage to take good care of your Hallet, Davis piano. It probably represents one of the largest money outlays in your home. Such an investment in music should be protected because music affects the emotional well being of every member in your household. Your investment in such a fine piano is lost if you do not keep the instrument tuned and in good regulation. The piano is normally an instrument of long life. Abuse, not use, is too often responsible for quick deterioration of its sensitive inner mechanism, and neglect, the failure to give a piano the care it needs, is the most needless kind of abuse. The piano action is a marvel of engineering which needs to be kept in good adjustment as accurately as any fine watch. The intricate parts of this mechanism are sturdy and are designed to absorb, for many years, the hardest blows a pianist’s fingers can deliver, and they will do so as long as they are kept in good condition and in the proper relationship to each other. You should play your new Hallet, Davis piano as often as possible. 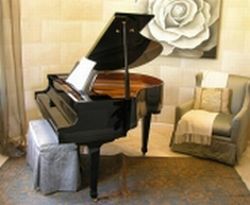 By playing and maintaining the piano you will receive the full benefits of owning such a great piano. Also, you will learn to appreciate the superb craftsmanship and artistry of the people who created your new Hallet, Davis piano. Where should you place your new piano? Your Hallet, Davis piano may be placed against any wall in a well insulated home, except in direct line with sunlight, a heating and/or air conditioning vent. The best location in an older home with poor insulation is on an inside wall. If possible, and for best performance, try to keep the room temperature between 72 and 75 degrees, with a relative humidity factor of 40 to 50 percent. As stated in the 10 year warranty, excessive dryness and extreme humidity are both harmful to the piano. Excessive dryness reduces moisture content of the soundboard and cabinet components, and can weaken the glue joints of the pinblock. This could lead to costly repairs, in any brand of piano. Dampness can cause rust to form on the strings, swelling to the soundboard and action parts, which then causes sluggish and/or sticking keys. No piano is immune to variations in atmospheric conditions. How should you move your piano? When moving a vertical piano that has legs that are not attached to the main cabinet of the piano. be sure to lift the piano off the front casters and roll the piano on the rear casters. When moving an upright type piano where the front legs are attached to a toe block which is then attached to the main cabinet of the piano you can roll it on all four casters. When moving a grand piano, the piano should be lifted and carried – rather than rolling the piano. By rolling, a leg could catch something in the flooring and snap off . The piano would probably fall to the floor and be damaged. Your piano is very heavy and could leave imprints in your flooring when you roll it. Our suggestion is to hire a qualified and bonded piano mover to insure a safer move. An inexperienced piano mover, with the wrong equipment, could cause serious damage to the piano. The standard international pitch is 440 cycles, or vibrations, per second. This is the pitch that sounds when the “A” above middle “C” is struck. If the piano is allowed to go ½ step below pitch, it can mean the difference of 3,000 to 5,000 pounds of tension on the strings and the soundboard. When a piano technician tells you your piano needs a pitch raise, he/she means the tension needs to be increased so that the piano tones can come back to standard pitch. Constant changes in the atmosphere will affect your piano. The wood in the soundboard, pinblock and bridges continually change, swelling when it is humid, shrinking when it is dry. This phenomenon, combined with the tension pulling the piano together, causes the strings to stretch and contract. Some strings stretch at a different rate than others. This is how your piano goes out of tune. All pianos go out of tune, whether played or not, because of expansion and contraction due to atmospheric changes. New pianos should be tuned three to four times the first year. Thereafter, twice a year, usually six weeks after weather changes in the Spring and the Fall. The best answer is, however, as often as the user feels it is necessary. Pianos used in concerts, recording studios, television and radio are tuned before each performance. Yes. If you want your piano to have a long and useful life, it must be kept in tune – even when not in use. The 20 plus tons of tension on the strings is held under proper control when the piano is in tune. Does tuning affect a piano’s tone? After considerable use, the hammer felts become hard and the strings cut grooves in the front surface of the hammers. With average home use, the hammers may need re-voicing every two or three years. Voicing should only be done by a highly skilled technician. What is a piano touch? Touch is the energy required to depress a piano key until it causes the hammer to strike the string. A pianist usually refers to touch as the ease and responsiveness with which a piano can be played. There are about 11,000 parts in the piano case and action. Over 4,000 of these are moving parts, each working in conjunction with other parts to produce the sound of the piano. At your regular tuning, your tuner/technician can check to see if the action regulation is in perfect order. Every few years, depending on how much the piano is played, you should have the action completely regulated. The condition under which your piano is played usually governs how often the action should be regulated. If you permit your tuner/technician to make any minor adjustments necessary at each tuning, you will avoid any possible expensive adjustments which may become necessary at some time in the future. Regular piano service safeguards any possible damage by mice and/or moths. Regular service insures the playing ability of your piano, protects your investment and guarantees a higher resale value. Will regular maintenance save money? Absolutely. Your piano will always be in perfect condition. You will prolong its life. It will have a higher resale value should you ever wish to sell or trade it in on another piano. What should I use to polish the cabinet? Keep your piano cabinet clean. The cabinet of your new Hallet, Davis piano is constructed of the finest quality veneers and hardwoods available, and are protected with hand rubbed, superior quality polyester finishes. Hallet, Davis pianos built before 1995 were lacquer finishes. To clean away dust and smudge marks, use a soft damp cloth. Take a soft cloth and spray some water with a spray bottle to lightly dampen the cloth. DO NOT spray the piano ONLY the cloth. Wipe the dust from the piano cabinet. Start at the back of the keys and wipe forward. Dry with the same type of soft cloth. Should you want to use a furniture polish you can BUT only on lacquer finishes and not on the keys. Post 1996 Hallet, Davis pianos were polyester finishes. Polished finishes (mirror like, wet look, very shiny) To clean away dust and smudge marks, use a soft damp cloth. Take a soft cloth and spray some water with a spray bottle to lightly dampen the cloth. DO NOT spray the piano ONLY the cloth. Wipe the dust from the piano cabinet. Start at the back of the keys and wipe forward. Dry with the same type of soft cloth. To increase the shine on the cabinet, use a soft cloth and apply a premium quality liquid wax, preferably one with silicones. Apply in long strokes as compared to circular motion.. Several excellent polishes are – Mequiar’s Mirror Glaze and Car Groom Final Finish. Both are available at automotive supply stores. Do not use anything with abrasives in it only polish. Remember – close the piano when sweeping or dusting. Post 1996 satin pianos were a sanded polyester finish to remove the shine of the piano. In 2005 we also started spraying a dulling agent to increase the warm luster look of this type of finish. To clean away dust and smudge marks, use a soft damp cloth. Take a soft cloth and spray some water with a spray bottle to lightly dampen the cloth. DO NOT spray the piano ONLY the cloth. Wipe the dust from the piano cabinet. Start at the back of the keys and wipe forward. Dry with the same type of soft cloth. Do not use anything else on these type of finishes. How do I clean the keys? Keep the keys clean by wiping them with a soft, damp cloth. If there is soil on the keys which a damp cloth will not remove, wipe the cloth across a cake of ivory soap. Then rub lengthwise along the top of the key until the spot is gone. Dry with a soft cloth. Do not use solvents or other chemicals to clean your piano keys. How do I clean the inside of the piano? The inside of your piano should be cleaned from time to time by a qualified piano technician. Cleaning helps to prevent damage to hammers, felts and corrosion of the metal parts. What should I do if a pencil or coin falls inside the piano? The action of your piano can be seriously affected by foreign objects. Never try to remove these objects yourself. Call a qualified piano technician to remove anything which has fallen into the action. A qualified piano technician has the knowledge and equipment necessary to maintain your piano.